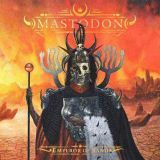 Many had pretty much given up on Mastodon after first The Hunter then Once More 'Round the Sun suggested the interesting prog-infused sludge of the band's earlier albums had been abandoned for something more plain, with a greater emphasis on the melodic. Neither are bad albums, especially The Hunter, but they are disappointingly straightforward given the earlier elemental concept albums that rewarded time and energy spent fathoming their secrets. The news, then, that the band's seventh full-length would be a concept album following the life and death of a desert traveller as a metaphor for living with cancer was intriguing, and after much time spent with Emperor of Sand, it's something of a return to form for Mastodon. Something like a mix of the lighter, more melodic recent material with the earlier prog bombast allowed to creep back in, Emperor of Sand is above all better-written than its predecessor album, sounding less like an average stoner rock band and more like the legends that their most ardent fans proclaim Mastodon to be. Above all, it's a grower, with many of the songs needing a little time to wheedle their way under your skin. Even the most straightforward track present, first single Show Yourself, has the multiple vocals and over-the-top drum performance that are the band's signature elements, but indulges a little more in the instrumental side of things with guitar soloing and general showing-off from guitarists Brent Hinds and Bill Kelliher. Opener Sultan's Curse has something of the roaring rollercoaster feel of the Leviathan era, albeit tempered with the modern melodic focus, and one of several songs that feels better as part of an overall album rather than merely one of many intended singles. Ironically, the likes of Precious Stones are catchier in spite of this, the vocals focused on delivering hooks while the instruments are allowed to shine. It makes for a more than cohesive whole, with songs having similar vibes while not actually being all that similar - Roots Remain having more of a melancholic edge which contrasts well with the more upbeat Word to the Wise, for example. The best songs on the album come at the end, too. Ancient Kingdom ups the prog feel with less of a hook-based approach without diluting the catchiness, Clandestiny ups the heaviness to the same effect, and Andromeda ups the groove, a guest spot from Brutal Truth legend Kevin Sharp adding to the impact. Jaguar God is ultimately the album highlight however, a near-eight minute epic that throws in acoustic guitar and keyboards for full prog indulgence. It's not the full-blooded, blood and thunder metal that fans of the band's earliest work would like, but as a band with the potential to be half as important to metal's place in the mainstream as Metallica, it is a sign that Mastodon are maturing well and, when taken with the album as a whole, an indication that the band are rediscovering the standards that they once hit with albums like Leviathan and Blood Mountain, if still a ways off from hitting that target. Still, Mastodon fans put off by recent output should give this a listen, as it is a good-to-great album and their best since Crack The Skye.